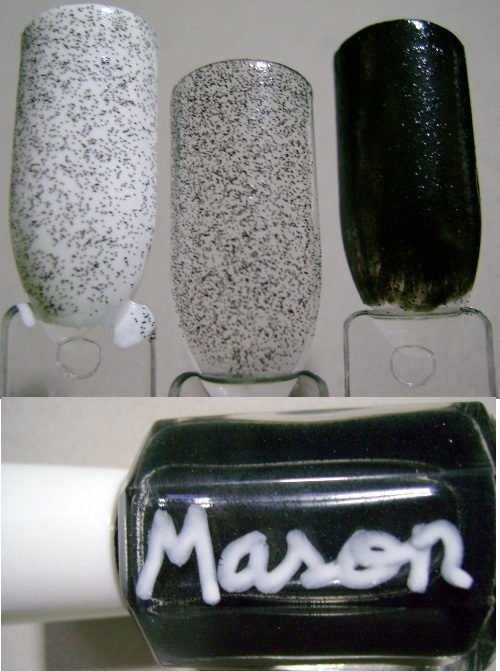 Review of some polish I bought myself from Simply Mason Candles on etsy. As always I bought these myself, I wasn't given the polish nor was I compensated any other way. Right then ! On to the review part. Their ordering and product shots leave a little something to be desired, They could use a bit better product descriptions and if you want fancy things these probably aren't for you. Prices are super reasonable full size price 5.00usd, mini price 2.50usd so I took a chance and I am glad I did. The non glitter polishes were fairly shimmery so I wouldn't call them a creme, they are not sheer and are opaque in about 2 thin coats, first coat is bit streaky but do not let that scare you, it will even out with second coat. First off Color number 3 Emerald, very shimmery deep green almost has a grey-ish undertone went on smoothly, I do not know what it is but I do love this color. Number 4 Sapphire I wouldn't call it sapphire, really, but I do not know what I would call it, has an almost purple undertone, very shimmery as well. 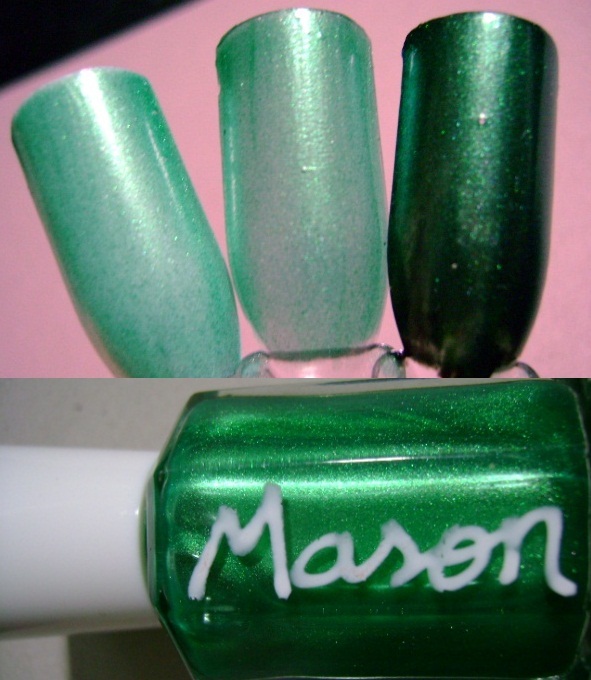 Number 10 which was named True Green very shimmery green in the bottle but it only really looked true green over black. Looked sort of a darker minty green over white and on its own. The glitters were all very fine glitter, applied smoothly and evenly, dried quickly and the texture wasn't very rough at all. I think these might even be cool to layer over each other and make your own mix :). Number 90 called White Glitter which it wasn't, I was bit disappointed that it wasn't an opaque white but this iridescent glitter is very very lovely on the nail. 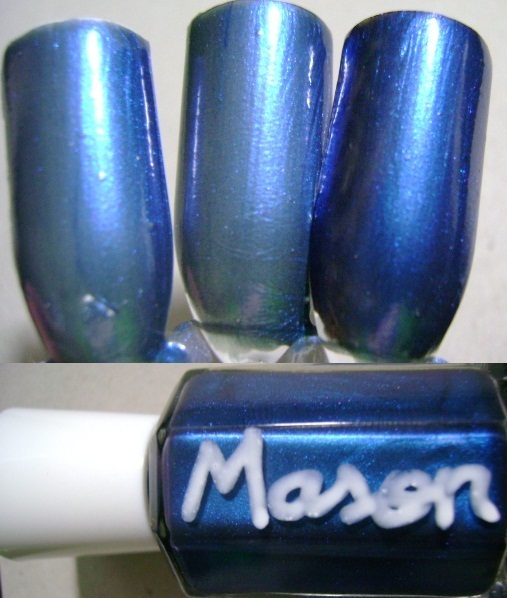 I think it is close or a dupe for several other polishes I own I may explore that more later. Number 99 Black glitter is very fine black glitter it isn't really shiny like a metallic but I don't think it is quite matte either. Looks bit like pepper on the nails and I must admit I was but surprised by my liking this one so much it isn't something I would normally buy. Number 87 Holo glitter. I have some other things like this in my collection it might also be a close dupe and again might explore that bit later. 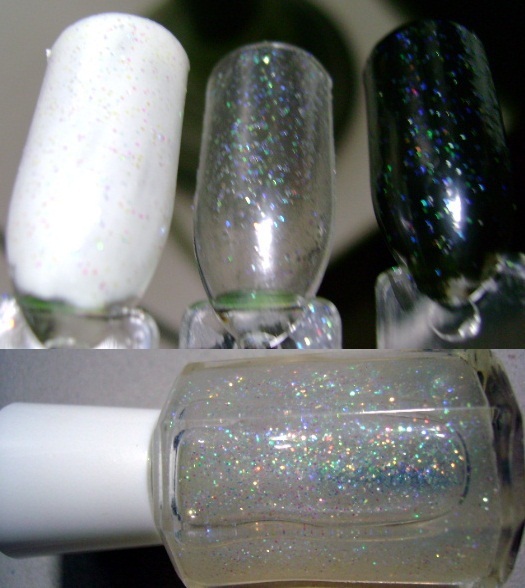 Its a silvery holographic glitter I think it would be awesome for some galaxy nails maybe. 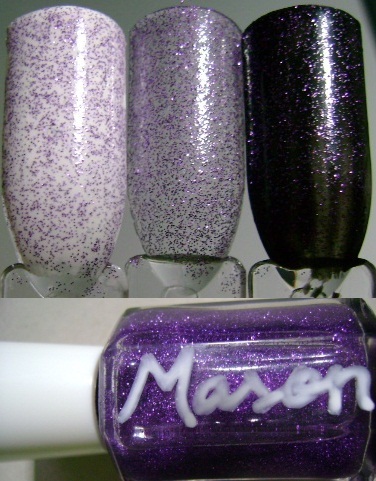 Number 96 Purple glitter Its a shiny metallic purple. very pretty on, also think it would be great for some galaxy nails. So that is end of that I am fairly happy with my purchases here I would definitely buy from them again. If you are looking for something simple from an Indie maker I'd definitely recommend this one.